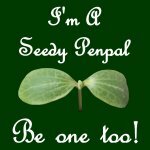 Since I seem to be unable to remember that the default on the mobile app is to publish rather than to save as a draft, here is a rather hurried post from yesterday’s evening meal, which I had intended to take a bit more time over creating. But, since some of you have already seen where I am, and liked the post that only basically contained a link to the site, here we go. The Big Guy and I are in New Zealand. We’ve been doing a bit of gourmet camping, of which more a bit later, but there is only so much one can do with a tiny gas stove, with gas that lasts about an hour, and a three course dinner isn’t one of them! We’ve been travelling around the Fiordland of the Southern Island, where life has been great, but the internet access has been patchy. Now we have moved towards the West coast, and have been on a number of pleasant walks and trips, including to the Fox and Franz Josef glaciers. It’s a tough life, eh? 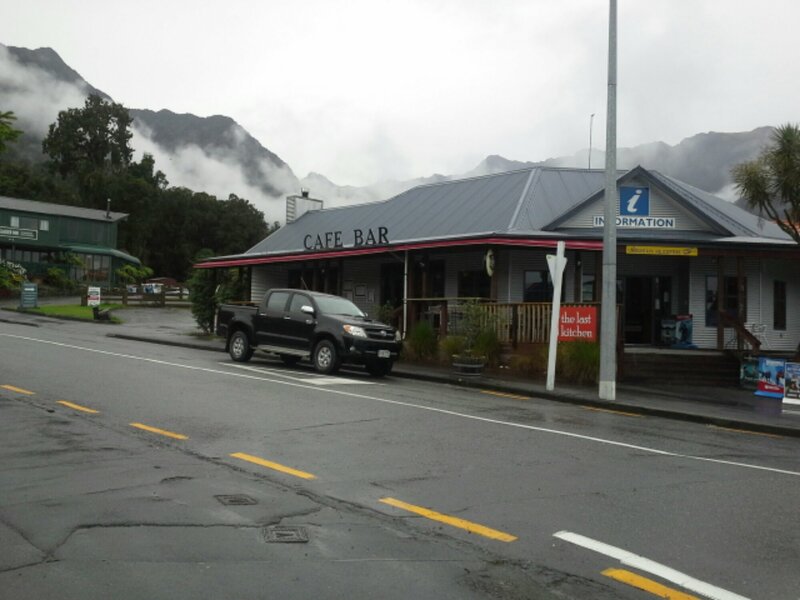 I wanted to share a very good meal that we had here, by way of recommending the Last Kitchen in Fox Glacier Township. It is a small, rather unassuming little place, that you might completely overlook, but that you probably shouldn’t. Not only is the food rather special, but it is a brilliantly warm welcome after a days hiking. There is nothing like great food served with a smile after physical exertion, is there? 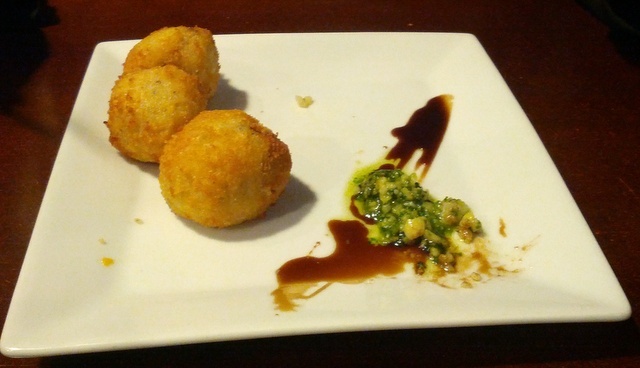 I started with the arancini. I’d already tucked into one of them before I remembered the photo, so the initial presentation was a lot neater. These were outstanding, golden and crisp on the outside, and the chorizo is a welcome peppery hit. 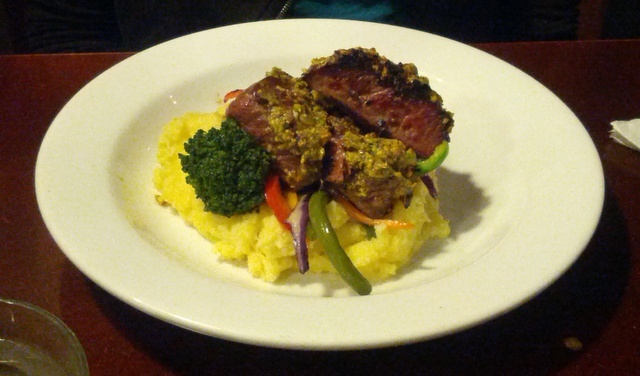 It is served with a fresh pesto, and balsamic reduction. The Big Guy loves to go for the familiar classics, and yesterday was no exception. 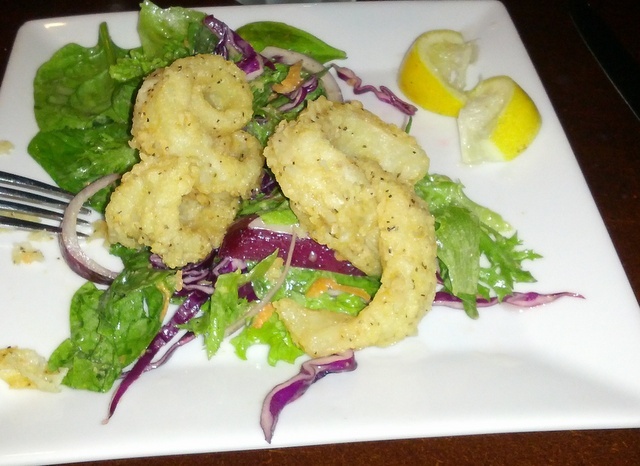 He started with excellent calamari, in a very light batter, served with salad. It was a well-done take on this classic dish. Main course took full advantage of the great local produce that you can see ranging all over the place here – namely lamb, beef and venison. I chose a beautiful piece of pistachio-crusted lamb, with a really buttery potato and celeriac mash, and wok-fried vegetables. This was lovely, and perfectly balanced. There was a delightful citrus element to the crust too, and the pistachios were in big lumps over the meat. The only criticism I have for the whole meal is that my lamb could have done with a slightly longer resting time, because it leaked the juices back onto the plate, making my mash pink in places, but that really was a minor quibble. Burger was the order of the day for the Big Guy. But this was no ordinary or staid burger, this was made from well seasoned lamb, and topped with a rich and spicy beetroot relish. Beetroot is not my favourite, but I loved this way of serving it. I was very pleased to see that the burger came in the correct order, too. It really annoys me that some establishments think that the salad should be atop the burger with the relishes, but this is clearly wrong. 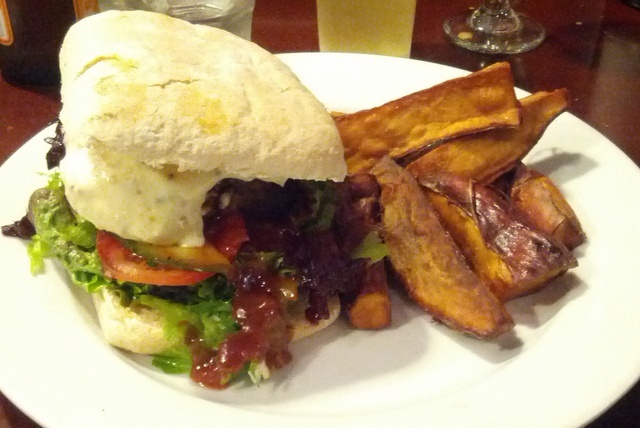 It’s always great to find a restaurant that knows that salad and relish should have burger in between! Although we had eaten heartily, we could just about manage some dessert. 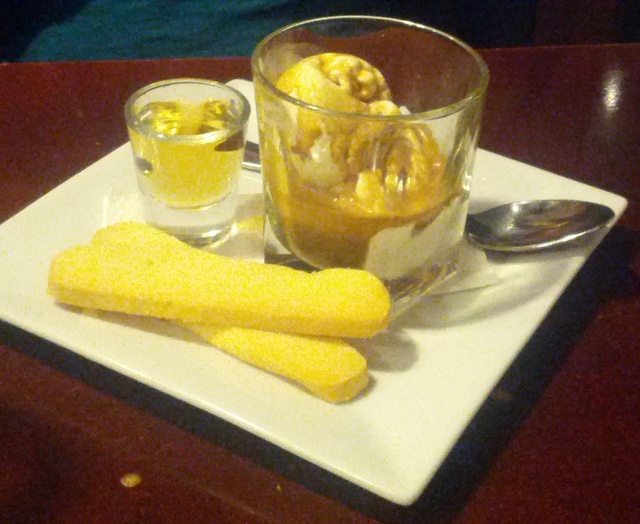 I had an affogato, which is essentially vanilla ice cream with an espresso poured over the top. The simplicity of the dish requires excellent ingredients, and I am happy to say that both really were. The ice cream was rich and smooth, whilst the coffee was deep and had the right balance of fruity and bitter tones. The shortbread was very buttery, and light, perfect for dipping in te ice cream, as one might a soldier into a runny egg (and who doesn’t love that?). 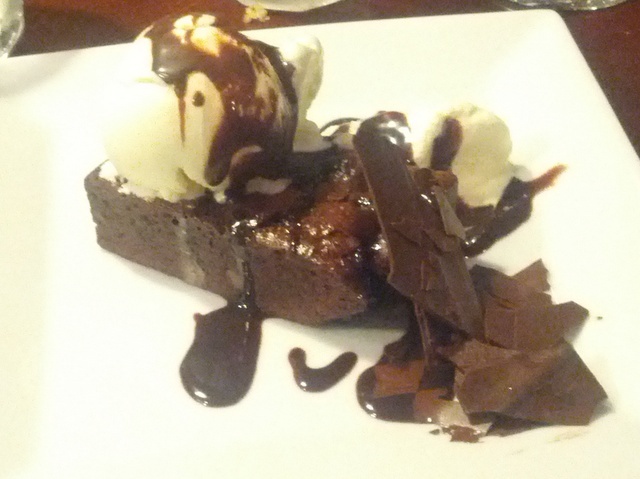 The Big Guy does love a chocolate brownie, and will always order it from a menu, although I have to say it was a tough choice for him this time, between this and the Chocolate and Baileys Cheesecake. As you can see, this was a big hitter in the chocolate stakes, and none the worse for that. We washed this all down with a very good local Shiraz/Syrah called Barnstormer, and had a really excellent meal. It was also one of the cheaper places that we dined in, which is surprising, because it’s out of the way location must mean delivery costs alone are higher. This meal was excellent value for money, and the wine prices were exceptionally good value too. So, I can thoroughly recommend this great little spot, in a very out-of-the-way location. Just remember to arrive hungry.